This is a picture from the scene of the WW11 RAF Banff Strike Wing Memorial at Boyndie, between Portsoy and Banff on a lay by at the A98 in Aberdeenshire, Scotland. The Monument has been hit by a vehicle at speed, knocking it from iots mounting and making t turn in 90 deg. It would appear to have been hit by a Red coloured vehicle. Photographed by JASPERIMAGE ©. One of the original trustees involved in creating a memorial to heroic airmen believes it is a “disgrace” the council have not told him about repair works. 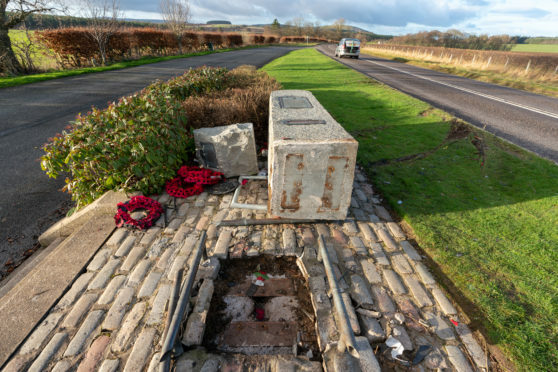 The granite commemoration to the RAF Banff Strike Wing unit was ripped from its foundations after an alleged drink-driver struck it last December. Since then the block has been laid on its side just yards away from the A98 Banff to Portsoy road. It was erected 30 years ago to mark the contribution made by a multinational air unit during the Second World War. But one of the original trustees involved in raising £40,000 for the memorial feels Aberdeenshire Council has failed to keep him informed of efforts to fix it. Les Taylor, who also came up with the design for the memorial and the plaques, feels he should be regularly updated on the plans. He said it was “extremely unprofessional” for the local authority to not let him know about the project. Mr Taylor said: “As one of the original trustees who built the memorial I find the lack of common courtesy by the council of simply keeping me informed of what they plan to do and when to be extremely unprofessional. “We raised some £40,000 to build this memorial in the 1980’s, mostly from Banff Strike Wing veterans around the world. Last night, a council spokeswoman said staff had been working on proposals to restore the memorial and have been dealing with insurers to recoup the cost as well as specialist trades to make sure the memorial is restored sensitively and accurately. She added: “We are on the verge of appointing a contractor to carry out this job, which we anticipate should be complete by the end of April. The airmen were based at Boyndie, near Banff, which was used to launch attacks on enemy shipping off the Norwegian coast during the Second World War. A strike wing was formed at RAF Banff in 1944 and was set up to specifically target supply ships vital for the Nazi war effort.